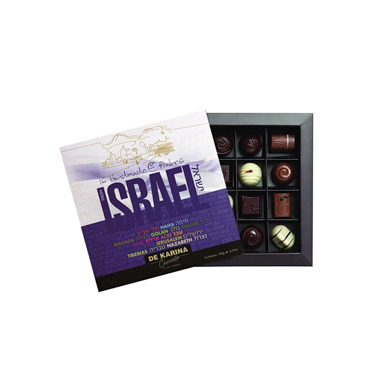 Below you can find products ordered by fellow Israel Travel Secrets readers - look for the text ordered by ITS readers and similar indications - as well as the most popular in Judaica and Israeli products based on a deep dive into data by JudaicaWebstore. Use the menu above to skip down to a category or just scroll and explore. 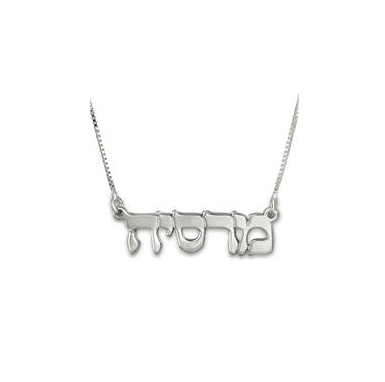 Express your identity with this classic necklace, featuring a pendant with your Hebrew name. If you need, we can do the translation into Hebrew. 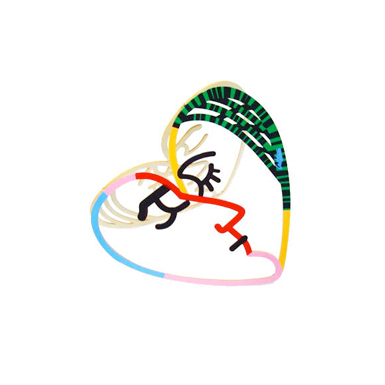 You're shown the translation before the pendant is made. 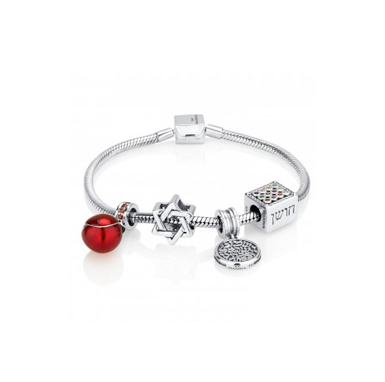 Treat yourself to a silver bracelet featuring Jewish charms that represent some classic Jewish ideas and themes, including the star of David, pomegranate, Shema Israel and the Kohen Gadol's breastplate or Choshen. This ring is fit for a king - or even two. 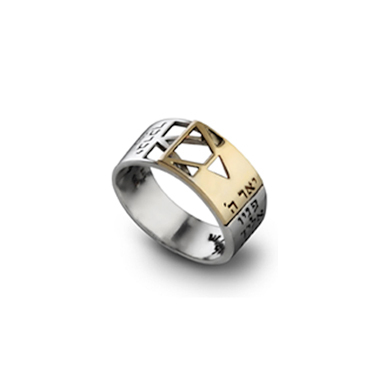 The Ethics of Our Fathers refers to the "crown of priesthood" and the "crown of royalty" - and this ring combines both themes with the priestly blessing and King David's symbol. 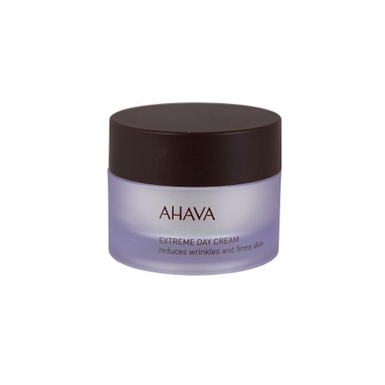 This cream combines Dead Sea minerals with unique rejuvenating ingredients from around the world. From the reviews: "This is the only face cream I will use. I am a grandmother and have had strangers think I am 15 years younger." "I am amazed at the change in my face." 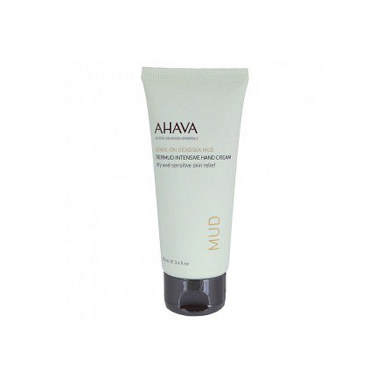 From the reviews: "I first ran into Ahava Hand Cream about 15 years ago and have kept using it steadily ever since. I use it for my face and body, as well as hands. It has a luxurious texture, is deeply moisturizing, and the Dead Sea mud compounds are deeply healing." 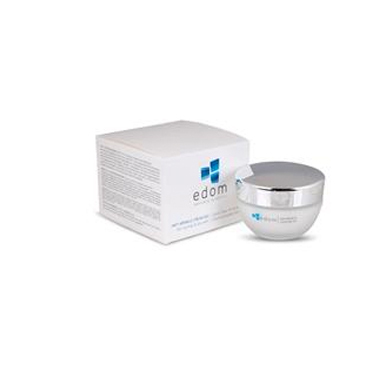 Edom's extremely popular cream reduces the appearance of wrinkles and rejuvenates the skin. Includes Q10, a coenzyme that acts as an antioxidant and fights free radicals. 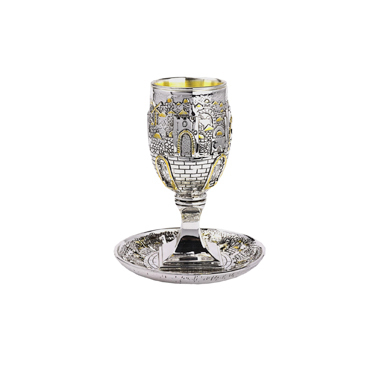 This stemmed kiddush cup features a 3D relief of Jerusalem with gold leaf. From the reviews: "Very beautifully made cup. I love the detail." These wooden, hand-painted candlesticks uniquely portray Jerusalem. They feature Jerusalem's skyline, and are shaped as a Star of David. The Star of David was King David's symbol, and King David made Jerusalem his capital. 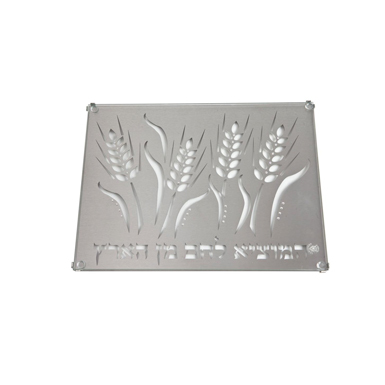 This remarkable challah cutting board elegantly depicts cut out wheat stalks, while underneath reads the blessing for bread, "Ha-Motzi Lechem Min Ha-Aretz." 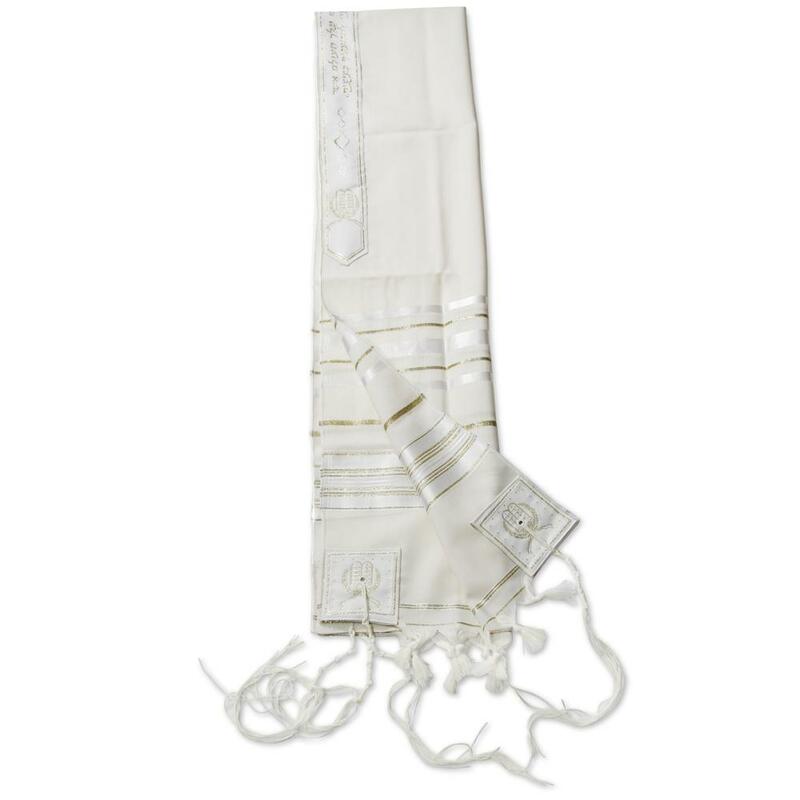 The Code of Jewish Law, or Shulchan Aruch, rules that a 100% wool tallit is certainly required, by the Torah and not only by the Rabbis, to have tzitzit (ritual fringes). This tallit is thus the ritually ideal way to fulfil the mitzvah. This replica features the full text of the Torah, with punctuation. 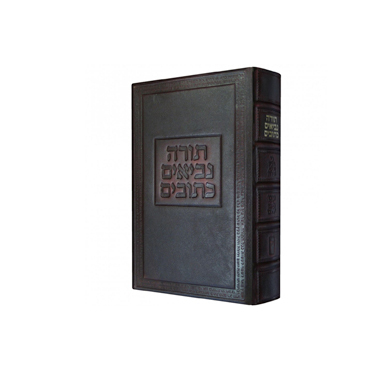 It's large size allows it to look like a regular Torah from the outside, and it comes with a traditional Ashkenazi cover. 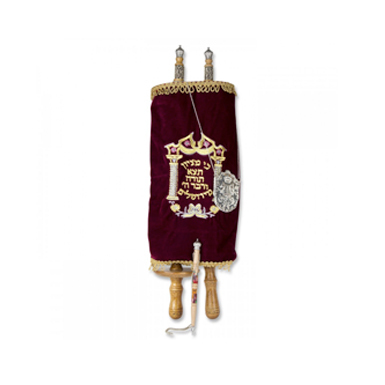 JudaicaWebstore also carry replicas with Sephardi cylindrical covers. 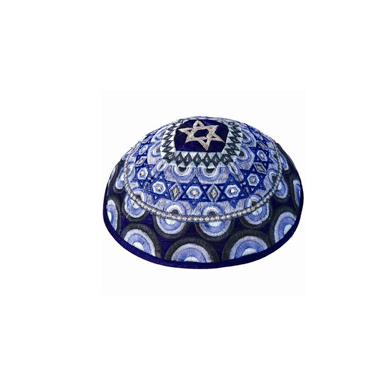 This silk kippah features an original Star of David design by Jerusalem-based Israeli artist Yair Emanuel. 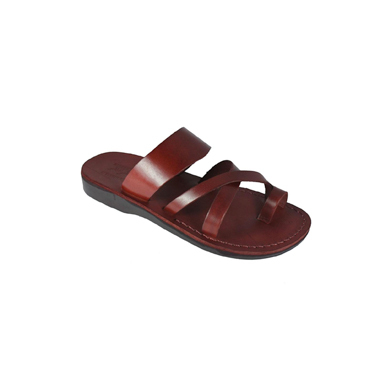 These attactive, custom, handmade leather sandals feature a comfortably smooth base with a thick strap across the midfoot while a stylish X-pattern secures the forefoot. Unisex design. 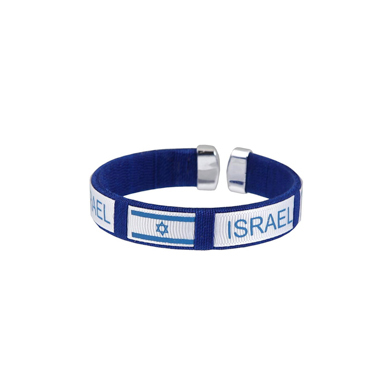 Show your support for Israel with this ever-popular bracelet. 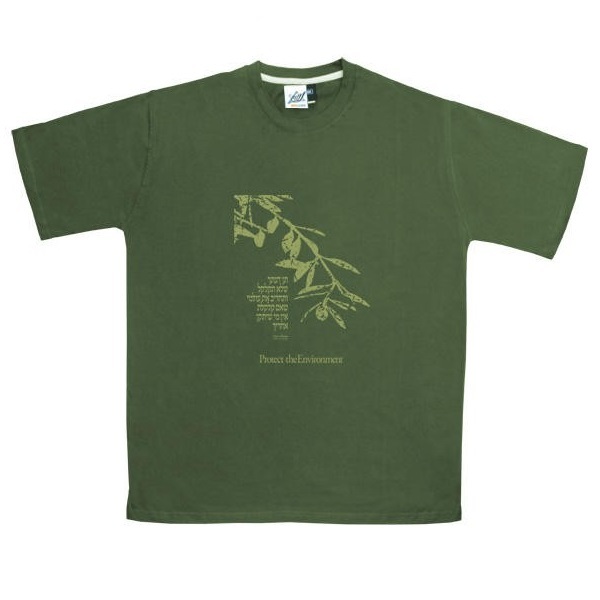 Also a great item for fundraisers as it's light, making bulk orders relatively inexpensive to ship. 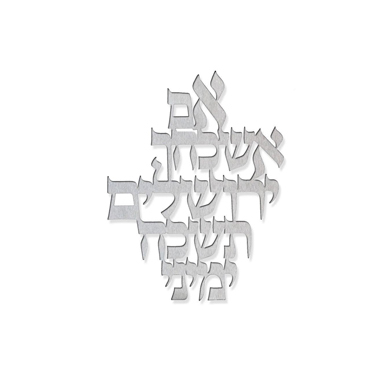 In Hebrew, the text reads: Protect the environment, because if you destroy, there won't be anyone after you to repair it. The stainless steel wall hanging reads: "In this home shall be found joy, health, wealth, blessing and peace." The Israel Museum Ahava (love) product line is adapted from the Museum's sculpture featuring the letters ordered as above. 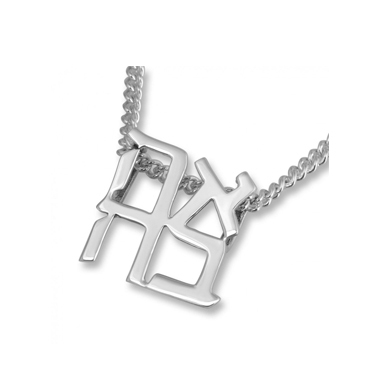 This .925 silver pendant is 1cm square. Bought as a Bat Mitzvah present, amongst others. 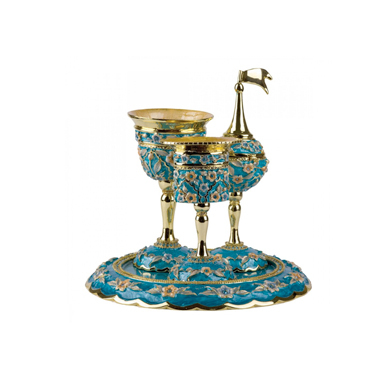 This havdalah set features turqouise enamel and gold-plating to produce an attractive set reminiscent of the shaping and styles of Renaissance-era havdalah sets in Europe. 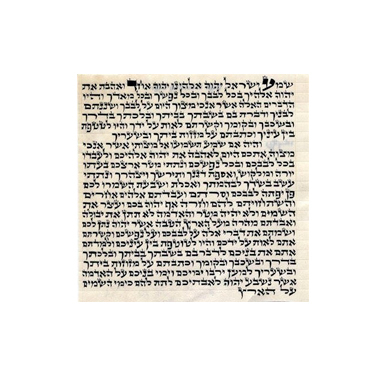 This mezuzah parchment features Ashkenazi script, meaning that it complies with Ashkenazic halachic views on the calligraphy of the text. 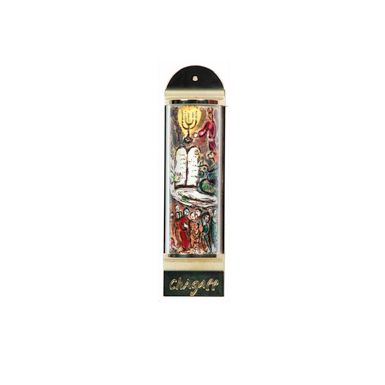 JudaicaWebstore also carry Sephardic script and Ari/Chasidic script mezuzah parchments. 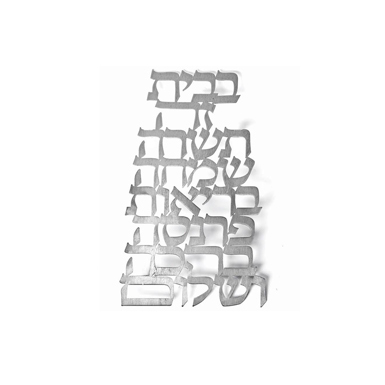 This stainless steel wall hanging reads: "If I forget thee, O Jerusalem, may I forget my right hand." 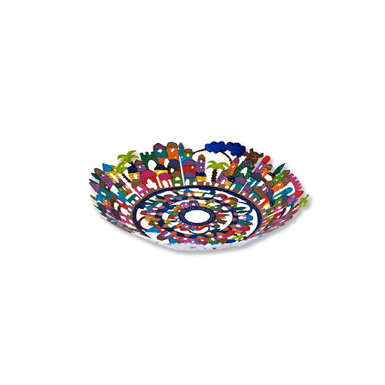 Perfect for your display case or your friend's, this laser cut, very colorful bowl brightens up a room or can also serve to hold large fruit such as pomegranates or apples. 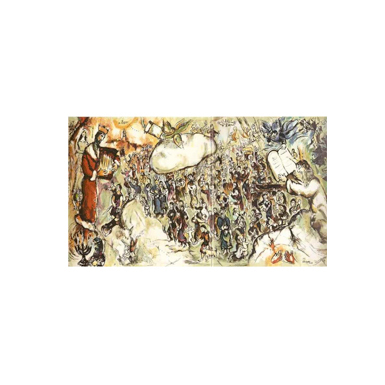 Based on Chagall's "I Am The Lord Thy God" painting, the art features the Children of Israel receiving the Ten Commandments under a burning Menorah. It is set in a gold-plated bronze case. The beautiful and exciting art deco look of this piece will add a fantastic splash to whatever room it adorns! Free standing serigraph on cut steel. Featuring Moses receiving the Torah on the right and King David and Jerusalem on the left, Chagall here imagines the connection of Israel's royal dynasty to its religious heritage. Key scenes and people of the Bible's classic stores are illustrated ("illuminated") in this unique work that reproduces and ancient practice and illustrative styles with modern technology. 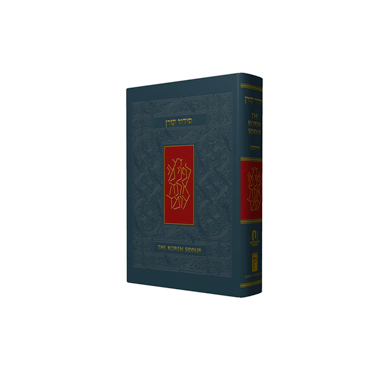 With a rich introduction and commentary by former Chief Rabbi Jonathan Sacks, this siddur is not just a prayer book, but also a means to study and understand why we say what we say. National Jewish Book Awards Finalist. 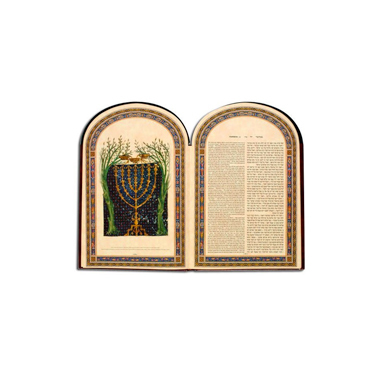 The Koren Readers' Tanakh features a unique, handcrafted leather binding, space to record key dates such as family celebrations, and has the approval of the Israeli Chief Rabbinate for haftara reading in synagogue. Featuring red wine and olive oil both from northern Israel. 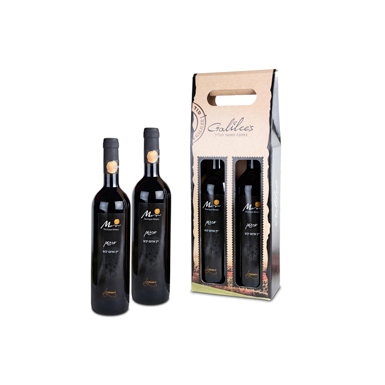 To help fight support the development of the Galilee area of Northern Israel, Galilee's brings together products from multiple farms and wineries and packages them as gift baskets. 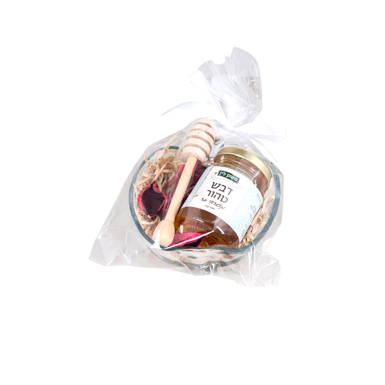 An affordable and appreciated present for Rosh Hashana! Lin's Farm is a boutique honey producer based near Sderot, but producing wine both in the Negev (southern Israeli desert) and Jerusalem foothills. Argentine-born Israeli Karina studied chocolate-making with top French experts. Here she brings you an assortment of her tastiest pralines. The shofar's blasts on Rosh HaShanah arouse people to repentance. 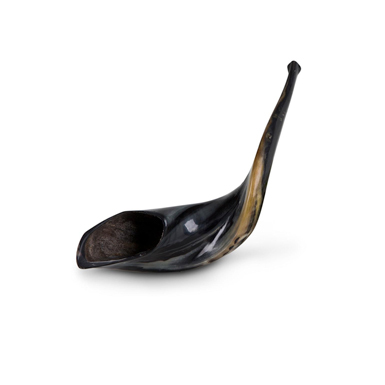 From the reviews: "We are so happy with our purchase of the Classical Ram's Shofar!" "This is a true blessing that came from the Land of Our Lord it brought her true reality of the Bible." 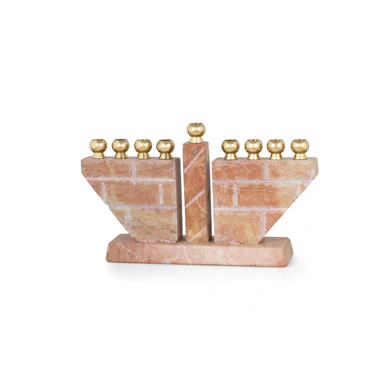 This Chanukkah Menorah is kosher for lighting the Hanukkah candles, which symbolize the Maccabees' victory and renewal of the Temple service including lighting of the Menorah. 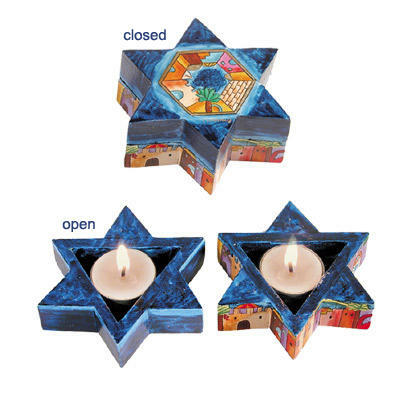 From the reviews: "I bought a beautiful menorah as a gift for my mother. She was overjoyed! " The Passover Seder features items symbolic of our affliction in Egypt and redemption therefrom. 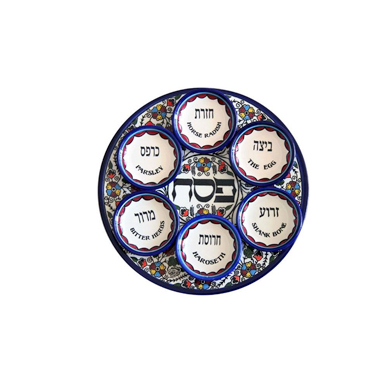 This plate labels the places for each item and makes it easy to perform this part of the mitzvah.